Pinterest revealed a lot about its users in an IPO filing. Pinterest revealed a trove of data about its more than 250 million monthly active users in an IPO filing on Friday (March 22). While Pablo, 32, from Buenos Aires; Priyanka, 25, from Mumbai; and Kaye, 70, from Louisville—all featured in the filing—are surely worthy of their own portraits, the filing also paints a picture of the typical Pinterest user, or “pinner.” 1 Here’s what we learned about her 2. "We call these people Pinners." 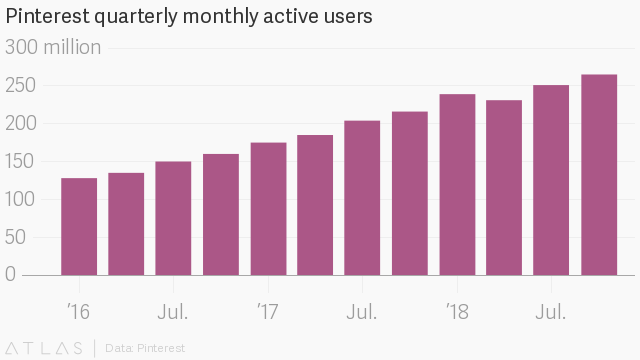 "Pinterest reaches more than 250 million monthly active users, two thirds of whom are female." The average Pinner types roughly eight searches per month 3 into Pinterest, mostly via her smartphone. But she spends most of her time on the platform scrolling through the array of “related pins” 4 that appears after she has tapped on an initial pin. She is increasingly likely to be from somewhere outside the United States 5, though Pinterest makes 36 times as much money 6 off Pinners in the US. There, Pinners are typically millennial mothers, 7 who shop and spend 8 more than the average US household. "Over two billion text based searches and guided searches happen on Pinterest every month, based on monthly average searches for the year ended December 31, 2018, with 85% on mobile devices." "These are Related Pins. They account for the highest source of engagement on Pinterest, helping Pinners springboard off a point of inspiration to explore deeper into an interest or narrow in on the perfect idea." "Our international MAUs have grown significantly as a result of our recent focus on localizing content in international markets. We expect this international user growth to continue to outpace U.S. user growth in the near term." "For the year ended December 31, 2018, U.S. ARPU was $9.04 and international ARPU was $0.25, which represent increases of 47% and 22%, respectively, compared to the year ended December 31, 2017." "In the United States, our total audience includes 43% of internet users, according to an independent study by Comscore based on total unique visitors to our service. This includes eight out of 10 moms, who are often the primary decision-makers when it comes to buying products and services for their household, as well as more than half of all U.S. millennials." "In analysis by Oracle of retail transactions from 2016 to 2017 showed that on average Pinterest households were 39% more likely to buy retail products, and they spent 29% more than the average household." "As of December 31, 2018, there are approximately 4 billion boards on Pinterest where Pinners have cumulatively saved over 175 billion Pins." "A portion of our MAUs visit Pinterest on a weekly basis. We define a weekly active user (“WAU”) as a logged-in Pinterest user who visits our website or opens our mobile application at least once during the seven-day period ending on the date of measurement. We actively monitor the relationship of WAUs to MAUs, which has stayed relatively consistent over time. As of December 31, 2018, the proportion of WAUs to MAUs was 57%."